Will we see these in Barcelona on February 25? LG is all about the mysterious video-based hints as MWC 2013 looms ever closer, but two of its upcoming Android devices seem to have been unofficially revealed on Twitter. 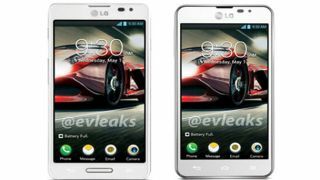 LG recently unveiled the Optimus L Series II trio and Optimus G Pro ahead of the Barcelona conference, but the EVleaks Twitter account has now posted an image of what it's claiming to be the LG Optimus F7 and LG Optimus F5. While both units have some slight differences between them, they certainly follow the style we'd expect from the Korean manufacturer. Right now there's nothing in the way of specs – all we've got to go on is this picture – but, if legit, it looks a dead cert that these are Android devices. We're fairly convinced by these pictures because the twitter account in question, EV Leaks, has shot to notoriety over the past months, with its phone leaks being more hit than miss. It also seems they're kicking off LG's new F series, as hinted in the recent teaser that highlighted four images and the rather intimidating taglines of "The StyLe", "The Freedom", "The Greatness", and "The View". The date seen on the phones in the image is May 1, so make of that what you will. LG will be holding its press event in Barcelona on February 25 so we expect to see something more official then. We'll be there, so stay tuned.